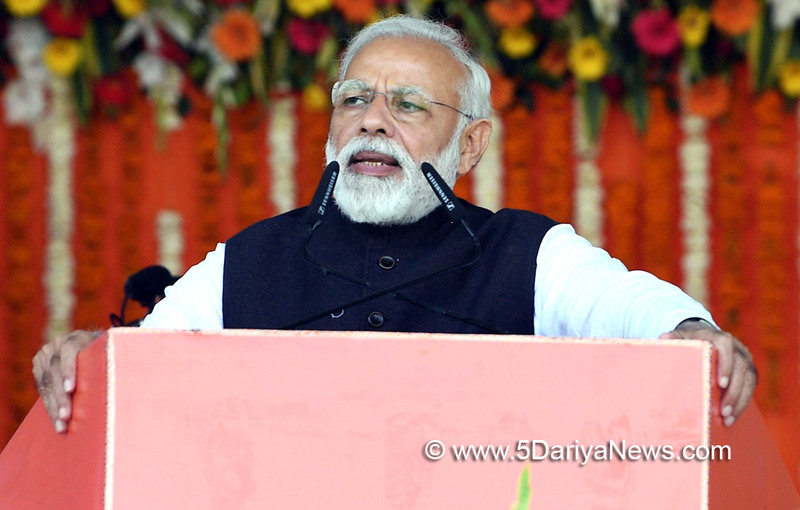 Prime Minister Narendra Modi tore into the opposition on Friday and slammed them for making "politically motivated" statements that are "demotivating the defence forces".Addressing a public rally in Kanpur, Modi said he is making this "serious charge" against some political opponents who, blinded by their dislike for Modi, are harming the interests of the nation.For political mileage and benefits, some political parties are making statements questioning the air strikes and the bravery and valour of our Army personnel, deliberately," he said.As people cheered him, Modi said at a time when the country is "fighting a decisive battle against terrorism to uproot it forever", there are some who are making statements in a language that become a "weapon in Pakistan's armoury" to speak against India on the global stage.He also talked about the Pulwama attack in which 40 CRPF troopers were killed.The Prime Minister asked the crowd to tell him whether they are satisfied with his reaction to the dastardly attack. When people responded with a yes, he said: "While your chest is getting pumped up and feeling proud of the air strikes, opposition parties are using the issue to settle political scores with me. Will the country ever forgive them? "Calling it a matter of disgrace, Modi went on to say that the "insiders in India" are doing things that are music to Pakistan's ears. "They are doubting the bravery of the armed forces, they are levelling dirty allegations against the government... Who will it help at the end of the day?" he said, alleging that the "enemies of the nation are doing this deliberately". There is immense pressure on Pakistan for patronising and protecting terror groups, the PM said, adding that the masterminds of the terror outfits smile when these allegations are made against him by "our very own" political parties. "Utterances, statements of our very own are giving ammunition to Pakistan, which has been caught red-handed in terrorism. Terrorists know it is end game for them and hence they are rattled. The grenade attack on bus in Jammu on Thursday was such an attempt," he pointed out.Assuring the people that the Union government is closing in on them and would uproot them for ever, he however stressed on the need for unity, peace and harmony in the country to enable his government to take decisive action against terror.Referring to the recent assault in Lucknow on two dry-fruit sellers from Kashmir, the Prime Minister lauded the Uttar Pradesh's Yogi Adityanath government for acting promptly and urged all state governments to act against such incidents. "Peace, unity and harmony in the nation will give me the intrinsic strength to take decisive action against terror," he said while seeking people's support in this endeavour.He also castigated the opposition for trying to stick up an alliance. "They are not bothered about the nation, poverty, terrorism, middle class, industry, army, Ganga...nothing," he said pointing out how the "mahamilawat alliance" is between people, "some of whom are in jail, some are soon going to jail and the others who are on bail".